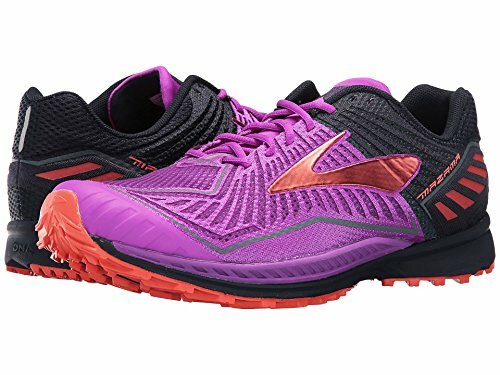 Take down the mountain in the light and speedy Brooks® Mazama trail-running shoe! Predecessor: None. Support Type: Neutral. Cushioning: Lightweight, flexible cushioning. Surface: Trail. Differential: 6 mm. Breathable mesh, textile, and synthetic upper materials. Durable water-resistant (DWR) upper finish helps ward off the elements. Saddle features adjustable eyelets that pull from the heel to wrap the mid-foot for a secure fit. Lace-up closure. Plush tongue and collar. Breathable fabric lining offers a great in-shoe feel. Removable foam insole. Full-length BioMoGo DNA midsole delivers dynamic, adaptive cushioning. Progressive Diagonal Rollbar (PDRB) guides the foot back into its natural gait pattern. Full-length Segmented Crash Pad promotes fast heel-to-toe transitions. Aggressive outsole delivers reliable traction over wet and tricky terrain. Updated V-Groove flexes deeper inward to better absorb and disperse impacting shock outward. Imported. Measurements: Weight: 8 oz Product measurements were taken using size 8, width B - Medium. Please note that measurements may vary by size.